There was much excitement this week on South Asia as the newly-crowned Indian Prime Minister Narendra Modi met with Pakistani Prime Minister Nawaz Sharif. Modi, who won the election with the largest mandate in 30 years, took the unprecedented step of inviting Sharif to his inauguration, and much to everyone’s surprise, Sharif accepted the invitation. That India and Pakistan are unfriendly neighbours, everyone knows. They’ve sparred over everything from cricket to their nuclear arms and even their mangoes. While improved ties between the two countries, which have been to war thrice since 1947, is undoubtedly desirable and crucial to peace in the region, what’s missing on any checklist is steps to improve the status of women in both countries. 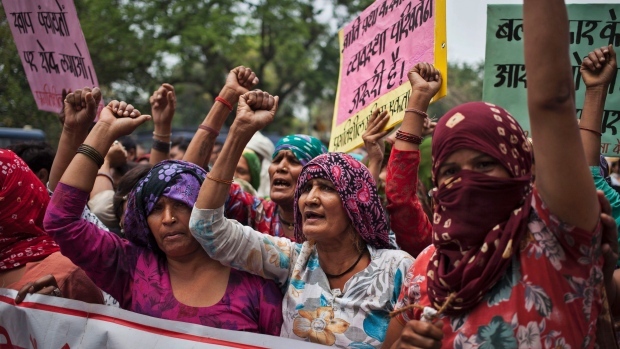 In the same week that the two leaders held their ground-breaking meeting, a pregnant woman was stoned to death outside a court in Lahore for marrying a man of her choice, while in India, two teen-aged girls were gang-raped and hanged from a tree in a village in Uttar Pradesh state. Sharif has condemned the incident in Pakistan; there is no official response yet from Modi. The two countries have a combined population of 1.4 billion. They have similar languages and cuisines, share customs and traditions, and a love for music, movies and cricket. They are also alike in treating their womenfolk badly. While the two countries have had a woman prime minister each and women in senior government positions, both rank low on the World Economic Forum’s Gender Gap Report: India at 101 and Pakistan at 135, one notch above the bottom and lower than their other neighbours. While Pakistan fares poorly on all four metrics, both countries do particularly badly on Economic Opportunity and Opportunity and Health and Survival. So while it is indeed important that the two prime ministers talk about terrorism, it is also equally important that they talk about the status of women in their countries, and what they can do to improve their lot. That would be truly ground-breaking. This entry was posted in Women and tagged Crime, gender, India, Pakistan, South Asia, women. Bookmark the permalink.